Slice. Dice. Done. 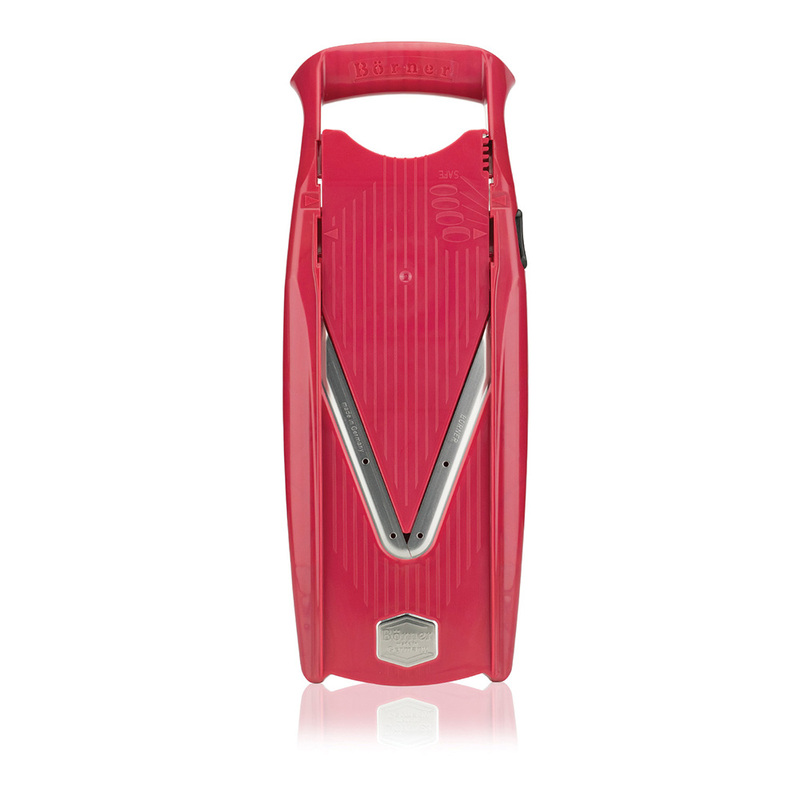 The ultimate mandoline, the innovative VPower V-Slicer. Adjust your slice thickness without removing the insert. Constructed from durable ABS plastic with German surgical grade stainless steel blades. Achieve up to 10 different cuts - julienne, slice, shred - even cube ! The patented safety setting provides worry free storage. With four fresh colors available, the strength is in the design, the power to create healthy meals is yours ! BÖRNER of Germany, manufactures the finest quality vegetable slicers on the market today and are leading edge in design and technology. The revolutionary VPower Set includes an insert holder for safe storage of blade inserts, V-Slicer body with V-Blade crafted from surgical grade stainless steel, 7mm and 3.5mm inserts for julienne, shred or cube cuts and safety holder. Includes easy to follow instruction manual. Available in 4 colours. V-Slicer body with V-Blade crafted from surgical grade stainless steel, shown with slicing plane insert that provides 4 precision slice thicknesses. Safety Holder is to be used at all times to ensure safe and easy use, as it completely guards your fingers. Stainless steel prongs pierce the food with a secure hold, allowing you to glide it along the V-Blade with very little pressure. Adjust your thickness or cutting size without removing the insert. Use the two 7mm and 3.5mm slicing plane inserts to achieve up to 10 different cuts - julienne, shred or cube cuts. Use the Insert Holder for safe storage of blade inserts - also acts as a drying stand. 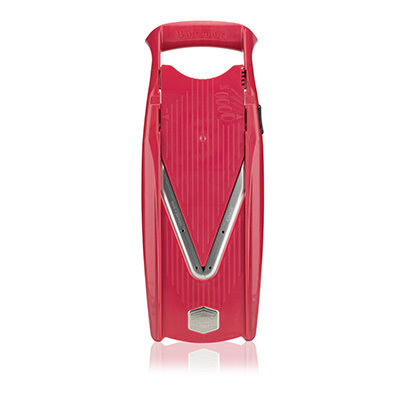 Set the plane slicing insert at “0” position when not in use or for storage, ensuring the V-Blade is not exposed.